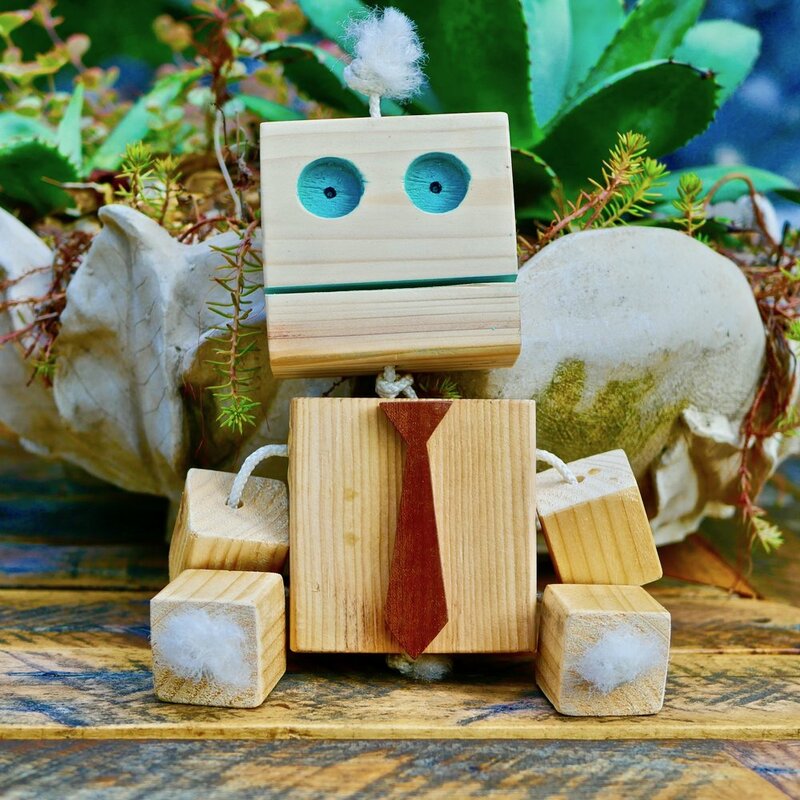 Looking for a fun DIY homemade toy project to make with your kids? 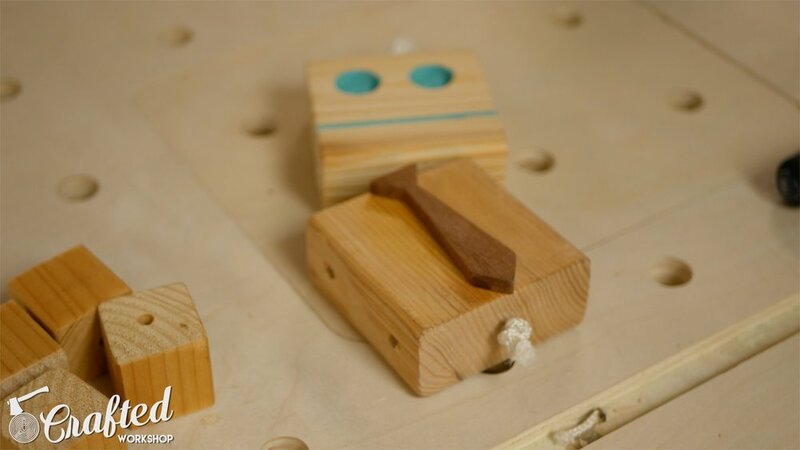 Check out this awesome wooden robot toy I built from 2x4s and 2x2s. This is a great project to use up some scraps you've had hanging around the shop and would make a great gift for kids. Enjoy the build! 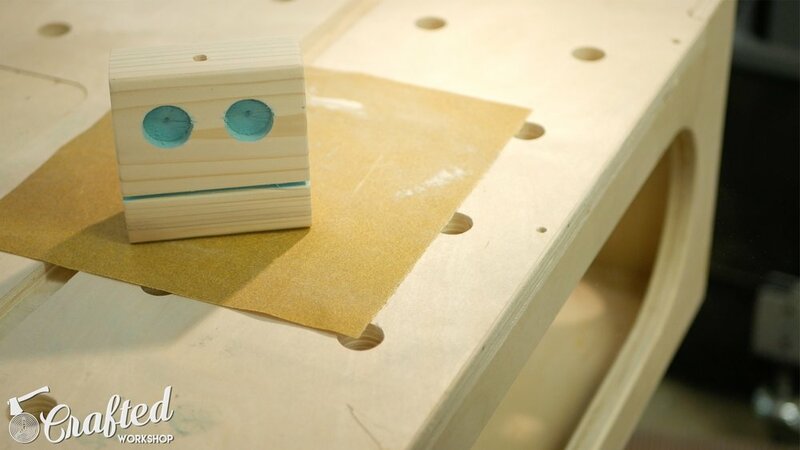 The first step in this project is cutting the slot for the robot’s mouth. I was making a bunch of these homemade toy kits for the Atlanta Maker Faire this past weekend, so I ran an 8 foot long 2x4 over my table saw with the depth of cut set at about ¼” and the fence set at about an 1”. All of the measurements for this project don’t need to be precise, you can make this robot look however you’d like. 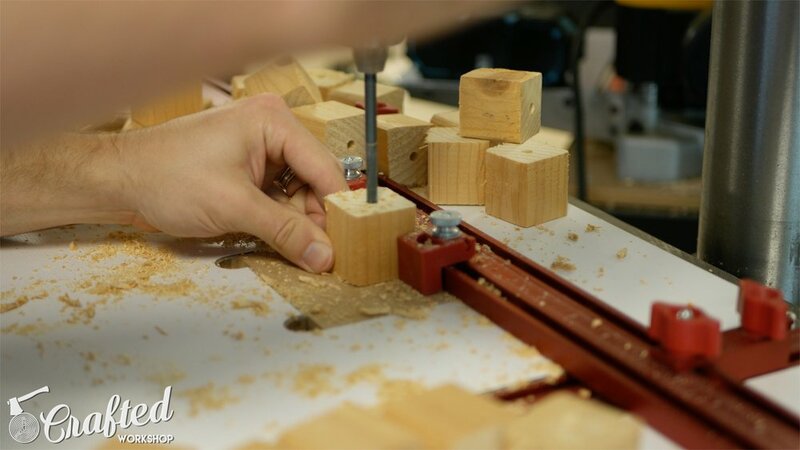 If you’re just building one of these robots from scraps, you will probably want to use a table saw as well, since a circular saw might be a little unstable on a small piece of scrap. After cutting the mouth, cut out the head for the robot. 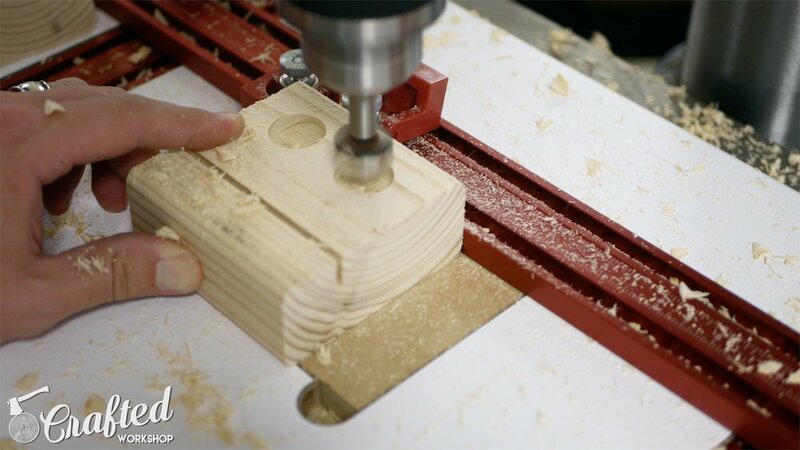 The head and body are 3.5” squares, so just cut a 3 ½” piece from your 2x4 to make the head. You should be left with a square with a slot for the mouth. 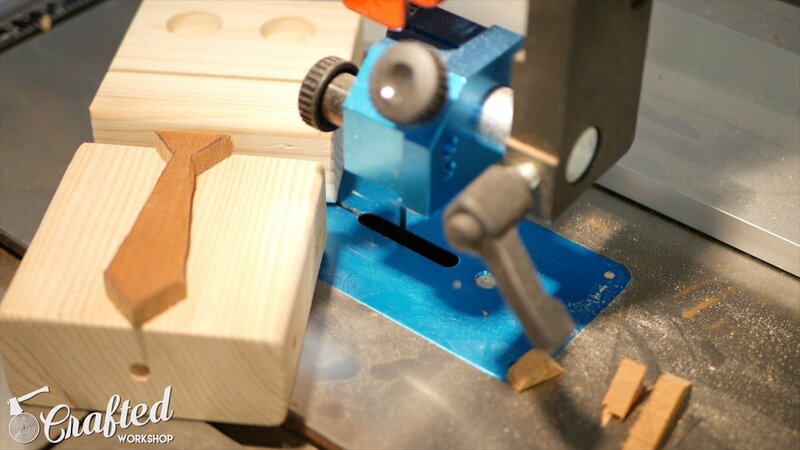 Using a Forstner bit, drill a few holes for the eyes. I used a drill press with a fence since I needed to make a bunch of repeated holes, but you could easily use a handheld drill. A Forstner bit leaves a little hole in the center of the hole, which makes it look even more like an eye. Now, cut the body in the same way you cut the head. 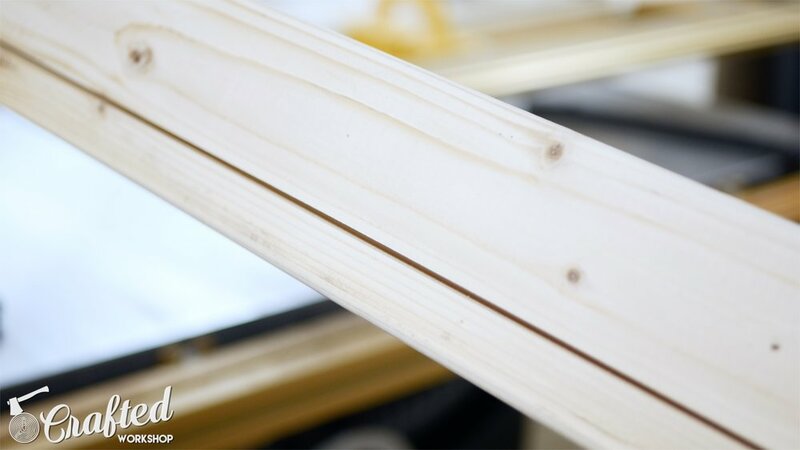 Again, the body is a 3 ½” square, so just cut a 3 ½” piece from a 2x4. Once you’ve gotten your head and body pieces cut for your homemade toy robot, you need to drill the holes for the rope to feed through. On the head, drill one vertical hole, roughly centered in the piece. Go all the way through the head and make sure you’re using a bit large enough so that you can thread the rope through the hole later. Next, drill the holes in the body. I oriented the body opposite to the head to give it a little contrast. 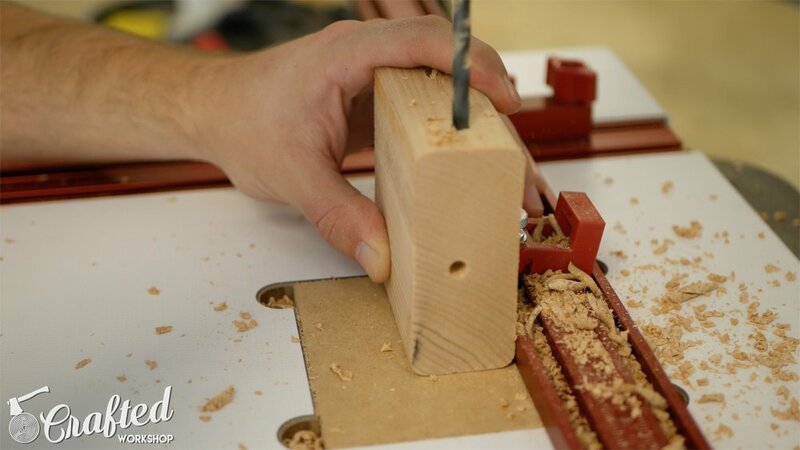 I drilled the vertical hole in the side grain of the head and in the end grain of the body. Once you’ve gotten the vertical hole drilled in the body, you need to drill the two horizontal holes for rope for the arms and legs to run through. Drill these in a different plane from the vertical hole, so that the rope doesn’t run into each other when attaching the head to the body and the arms and legs to the body. More on that later. After drilling holes in the head and body, drill holes in the arms and legs. I evidently lost some footage of cutting the arms and legs, but they’re the same idea as the head and body, except they’re cut from 2x2 material. 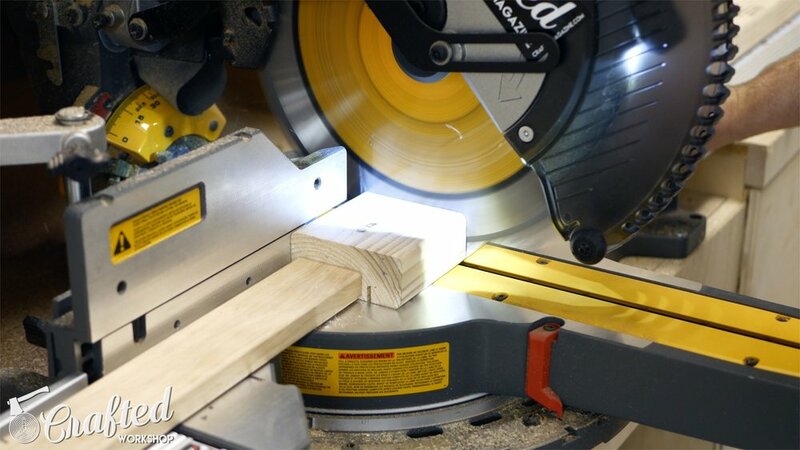 I set my stop block on the miter saw to 1 ½” and made 1 ½” cubes. Once you have them cut, drill the holes in the arms and legs. Again, roughly center the hole. Now the fun part, sanding! Or not. 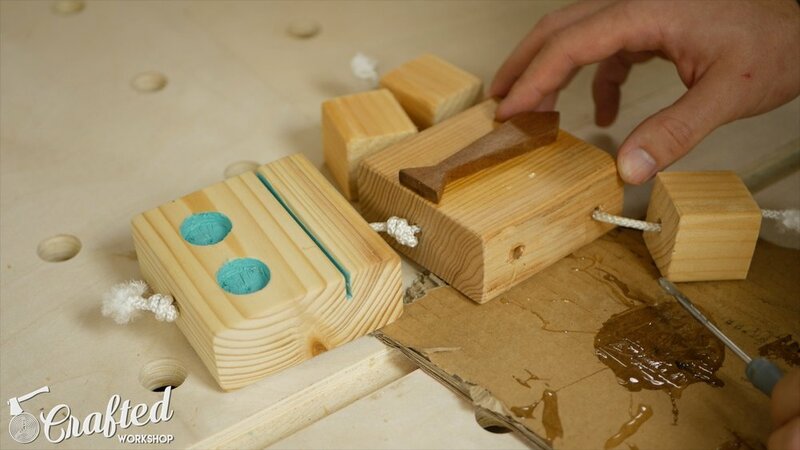 I made 30 of these homemade toy kits for the Atlanta Maker Faire, which meant I had 180 tiny pieces of wood to sand. Luckily, the oscillating belt sander made quick work of the 2x4 pieces, but the 2x2 pieces were too small to use the belt sander without sanding the tips of my fingers off. I sanded each of the 120 arm and leg pieces by hand. Needless to say, my arms were very tired by the end of that sanding session. After sanding, I decided to add a little flare to my robot and cut a tie for him on the bandsaw. I used a small scrap piece of Sapele, leftover from my guitar build, and just roughed out the shape at the bandsaw and then sanded it smooth by hand. To add some color to the eyes and mouth, I spray painted the entire front surface of the head, making sure to fill in the eyes and mouth, and then sanded off the paint once it had dried. This leaves you with paint in the eyes and mouth and adds a nice contrast. For finishing, I used a simple spray polyurethane. If this is for your kids and you think they might be putting the pieces in their mouth, you might want to consider a food safe finish like a mineral oil or salad bowl finish. There are a bunch of good options out there, just do some research and you’ll find something that works for you. Once you’ve got your finish applied, it’s time for assembly. First, I threaded the rope through the head, tying knots on each end. Next, I threaded that same rope vertically through the body and tied another knot at the bottom. Next, I tried to thread the rope horizontally through the body for the legs and feet. Unfortunately, this is where I realized I had made a major error. I drilled the vertical and horizontal holes in the body in the same plane, since I had the fence set to the same position for all of the holes. This meant that, once I went to assemble the robots, I couldn’t thread the rope for the arms and legs through since the rope going vertically through the body was blocking the holes. Of course, I didn’t assemble a test robot before making 30 of these kits, so I had to rethink my method of attaching the legs and arms. If you’re building this kit from scratch, I’d recommend just drilling the holes slightly offset from one another to avoid this. That way, you won’t have to deal with any glueing. For my robot, and also if you got a kit from me at the Maker Faire in Atlanta, you will need to cut short pieces of rope for the legs and arms and tie knots to keep them secured onto the pieces. Next, you will need to glue in the rope into the holes on the side of the body. I used 5 minute epoxy, but you might try Elmer’s Glue, a hot glue gun, or any other strong adhesive. If you’re assembling this with your kids, Elmer’s Glue is probably your best bet. Use plenty to make sure the arms and legs don’t pop off later. Once the glue is set up, you’re robot is complete! I hope you enjoyed this simple homemade toy robot build! If you build your own robot, I would love to see it. Leave a comment below or tag me on social media @craftedworkshop so I can see what you came up with. To make sure you don't miss any future Crafted Workshop videos, subscribe to our YouTube channel! If you really enjoyed this video, consider supporting us on Patreon! And last, follow us on social media on Facebook, Twitter, Instagram, Pinterest and Snapchat at @craftedmagazine! Thanks for your support.